The main center of interest of the region is the town of Gerri de la Sal, its name is attributed to the presence of a salt water source, water that crosses the subsoil layers salted to bloom on the outside. The water of the spring was carried by pipelines made of pine to the salification tables, so that later, the evaporation of the salt was carried out. Activity that is documented since the 9th century, of which currently only a small craft production. The testimony of its rich past is the abbey (Benedictine) of the twelfth century, the Romanesque bridge of the eleventh century, the medieval town (a set of old houses that give the narrow streets labyrinth shape), the “house of salt” (Where salt was stored) the prison tower, and of course, its salt water distribution systems and salt production. The gastronomy of the Pallars is rich and varied: a large number of cheeses, sausages, a diverse vegetable garden and some sheep breeds and native reel. Hunting and pork products are the most abundant, including the typical Girella, made with lamb meat and egg. How do we teach you? Impregnated by the aromas of thyme and rosemary, we will enter this magnificent region in order to enjoy a small village abandoned at 1300m altitude. 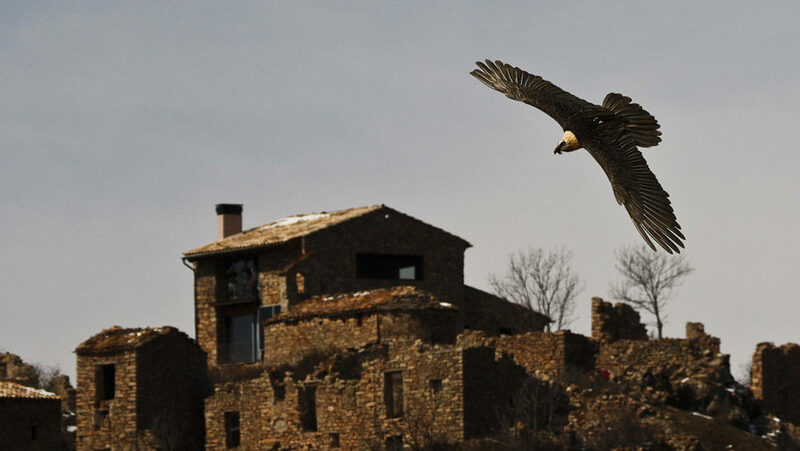 We will settle in a comfortable country house, in a privileged environment, where we can watch the spectacle right before us of all the carrioners of Europe: up to 20 vultures, griffon vultures, black vultures and from March to September, alimoches.